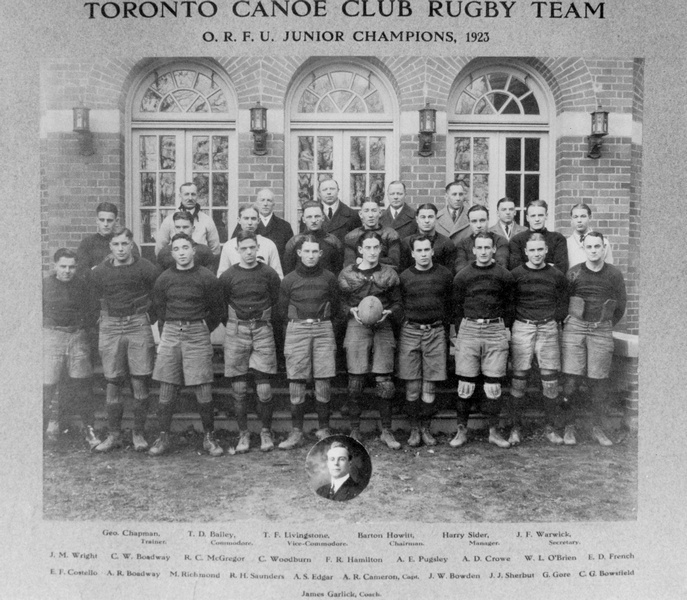 In 1880, the newly founded Toronto Canoe Club adopted as its burgee a white flag with a red ring. Under this symbol, which was derived from a design of the Royal Canoe Club of London, England, the T.C.C. 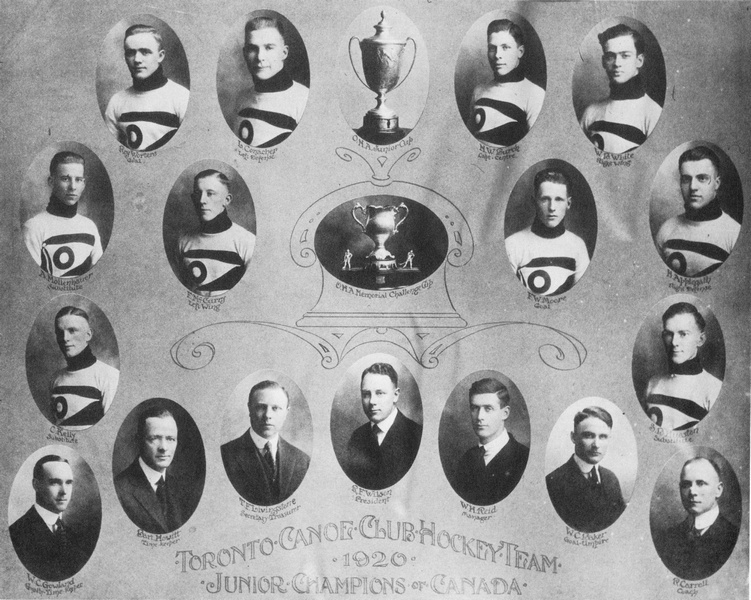 by 1920 had become the largest club of its kind in the world. The original impetus was to provide opportunities for amateur canoeists to race and cruise, but from the start sailing played a part in club activities. In 1939 T.C.C. was reorganized as the Toronto Sailing and Canoe Club. From these beginnings evolved a tradition of active canoeing and sailing participation on a regional and international basis. For 135 years, the Red Ring has symbolized an active aquatic sports presence on the Toronto waterfront. 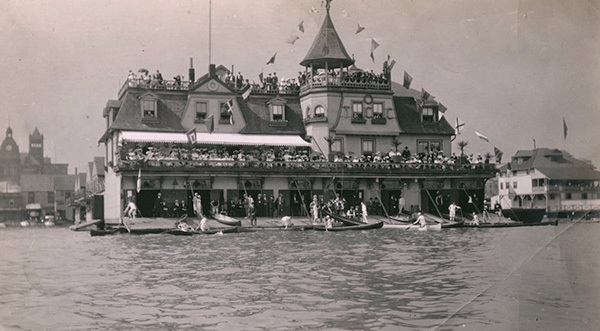 Toronto Canoe Club on the downtown waterfront in 1906. That's old Union Station in the background on the left. A series of early clubhouses were built in Toronto’s Inner Harbour, expanding in size each time as the membership grew, until in 1911 the newly formed Toronto Harbour Commission decided to develop deep water slips in the harbour to accommodate large freighters. After World War I the T.C.C. was moved to the western waterfront shoreline, which by then was protected by construction of a breakwall stretching from the Western Gap to the Humber River. The club at this time occupied a grand house on a four acre estate at the foot of Dowling Avenue and developed ambitious plans for lawn bowling, tennis, badminton and swimming, which also included championship hockey and rugby teams. The club however, went deep into debt until in 1929 it was near financial collapse. Triggered by the expropriation of waterfront lands, the T.C.C. negotiated the sale of its property to the City to pay off its debts and agreed to lease a portion of the waterfront – still occupied by the TS&CC, where it was able to survive in reduced circumstances as an aquatic club. Sailing membership increased from the 1930’s onward until in the 1960’s, sailing was the predominant activity. In the winter of 1957 the club suffered a disastrous fire that completely destroyed the clubhouse along with 100 dinghies and canoes stored inside. The clubhouse was rebuilt in 1960 with a loan from the City, and is still in use today. A fierce storm in January 1978 brought hurricane force winds that tore out portions of the breakwall as well as both of the club’s permanent docks. Fortunately the Federal Government agreed to rebuild the seawall the following winter, as the club is dependent on this shoreline protection against the occasional violent storms on Lake Ontario originating from the south. Today the Toronto Sailing & Canoe Club continues to serve a diverse membership, many coming from the local communities, but also from outlying areas of the city. There are healthy fleets of racing and cruising keelboats, sailing dinghies and canoes along with as many as six Dragonboat teams. TS&CC operates as a volunteer organization, each member being required to contribute his or her time to the operation and maintenance of the club, helping to keep membership costs affordable. One of the mandates of the club is to provide opportunities to race, with the belief that competitive racing develops sailing skills. And to further the development of skills, the club runs a very successful sailing school program for both children and adults introducing them to a lifetime enjoyment of sailing. Check out our slide show of photos from our archives, below.